petition: There Are Only 420 of These Critically Endangered Whales Left! There Are Only 420 of These Critically Endangered Whales Left! Once considered the "right" whales to kill, North Atlantic right whales were so heavily exploited they were nearly hunted to extinction. Even though they were protected under the Endangered Species Act decades ago, and kept safe from being slaughtered with a moratorium on commercial whaling, they have yet to recover. Sadly, these gentle giants continue to face a barrage of modern-day threats ranging from pollution and energy exploration to climate change, but entanglements in fishing gear and ship strikes are now believed to be the biggest threats to their survival. Since the summer of 2017, 20 deaths have been documented off the coasts of the U.S. and Canada, which were pretty catastrophic for a population that's so small, but combined with fewer births over the years the problem is even bigger and has raised concerns about their ability to withstand these ongoing pressures. 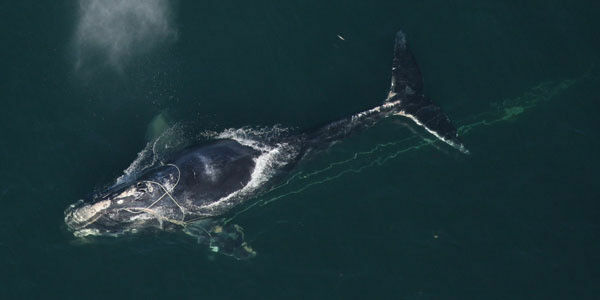 In response, Representatives Seth Moulton and John Rutherford have introduced the Scientific Assistance for Very Endangered (SAVE) Right Whales Act (HR 1568), which would ensure funding for public and private partnerships working on the development of urgently needed technology and other innovations intended to prevent both ship strikes and entanglements in fishing gear. These whales can't wait any longer for us to act. There are now only believed to be about 420 left in existence, making them one of the most endangered whales on earth, and scientists estimate they could be functionally extinct by 2040 if we don't take urgent action to save them. Please sign this petition urging Congress to pass the SAVE Right Whales Act.